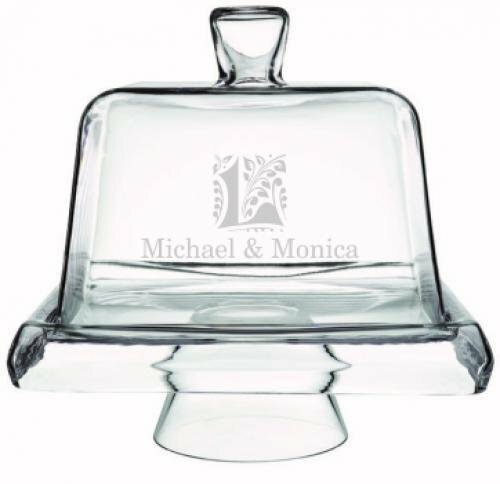 A glass cake stand with lid. PLUS it moonlights as a chip-n-dip server. How awesome is that? Great for wedding gifts, anniversaries, birthdays, or buy it for yourself. Lid will accomodate a tall 8" cake, or a short 9" cake. 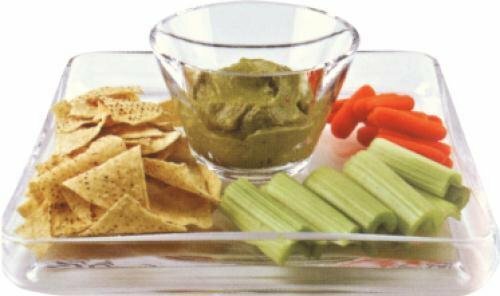 Turn the base over and use for chips & dip. Overall size is 12" W x 12"D x 12-1/2"H including top handle. Engraved price includes up to 16 words and one graphic sandblasted on one side of lid. Extra words 25¢ each. Unengraved price is with no text or graphics. Engraved award cannot be rushed. Production lead time for this award is 5 days. This award has a maximum order quantity of 1.